'Fort McMurray was incinerated in a wildfire creating 80,000 climate refugees overnight. As tragic as this fire was, it is just one more city being destroyed in our climate change casino. Every city on our planet is vulnerable. Governments must do the right thing and declare a global climate change emergency.' 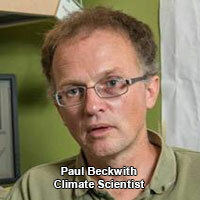 Says Paul Beckwith, a University of Ottawa climate expert. High winds and parched timber and brush from a spring heat wave stoked flames, which have engulfed 247,000 acres (101,000 hectares) in Canada's energy heartland since erupting May 2nd. Some 88,000 people were forced to flee Fort McMurray two days later. About a third of Canada's oil production has been shut due to wildfire storm, according to a Reuters estimate. Canada's northern forests have been burning more frequently over recent decades as temperatures there are rising at twice the rate of the global average. A 2013 analysis showed that the boreal forests of Alaska and northern Canada are now burning at a rate unseen in at least the past 10,000 years. The extreme weather of recent months is also closely linked with the ongoing record-setting El Niño conditions in the Pacific Ocean, which tends to bring a warmer and drier winter to this part of Canada. Last month, Canadian officials mentioned the possibility of "large fires" after over-winter snowpack was 60 to 85 percent below normal and drought conditions worsened. In 2012 a panel of experts issued a report that warned that the aging forests in Alberta were at great risk of 'catastrophic' wildfires. The Flat Top Complex report, named after the three fires which devastated Slave Lake in 2011, found that Alberta's forests were aging due to reduced wildfire activity that challenged ecosystems and increased the risk "of large and potentially catastrophic wildfires."